The word I least want to see on a radiology report is progression. Resolution, in any form, is a highly coveted term, but next best is stability. Yesterday we went over my latest scan with Dr. Shaw. In marked contrast to the previous radiology report, this one was short and sweet. Slowly, I really like the sound of that as well. Alice (Dr. Shaw) was also quite pleased with the report. The fact that there are no new lesions and no growth in previously identified nodules, suggests that my cancer is yet responding in part to the 1066. It also means that it is appropriate for me to stay on 1066 at least until my next scan in mid August. This buys me more time (always of the essence) and also gives those pharmaceutical companies an opportunity to further tweak whatever is next in my anti-cancer arsenal. David and I also had the opportunity to meet two other couples at the hospital yesterday who are engaged in similar battles. Leslie and Steve and Sue and Matt, although I wish we’d had a chance to be introduced under different circumstances, it was a pleasure and I hope we’ll see each other again, and again (for years and years!). As I sat in the waiting room yesterday, I was really struck by how many young people were there. Five years ago, when I first started hanging out here, most of the patients were significantly older than myself. Sadly, that seems to be changing. But then, much has changed, and whereas progression in an individual cancer is a dirty word, progress in the lab is a very good thing indeed. My oncologist, Dr. Alice Shaw, is one of several researchers at the forefront of recent discoveries in lung cancer; discoveries which promise some hope in this hard-to-treat disease. More good news to report, close to the home front. On Sunday the boys (David, Peter, Buddy) and I went for a hike in the woods. 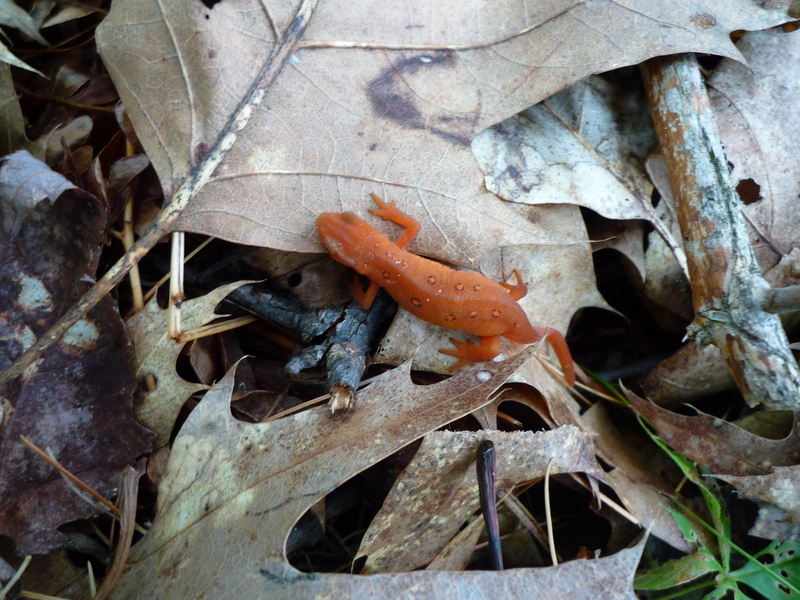 I was mostly looking for the reddish orange newts which appear underfoot at this time of year. We saw plenty of those, but also spotted not one, but two, black bear in the woods. The first one was an adolescent and disappeared deeper into the forest so quickly that I only heard but didn’t see him. The second bear was very large, and we watched him for several minutes as he lumbered through the trees and then a clearing. He was spectacular. And no, I’m not a good action photographer, so I didn’t capture him on film. 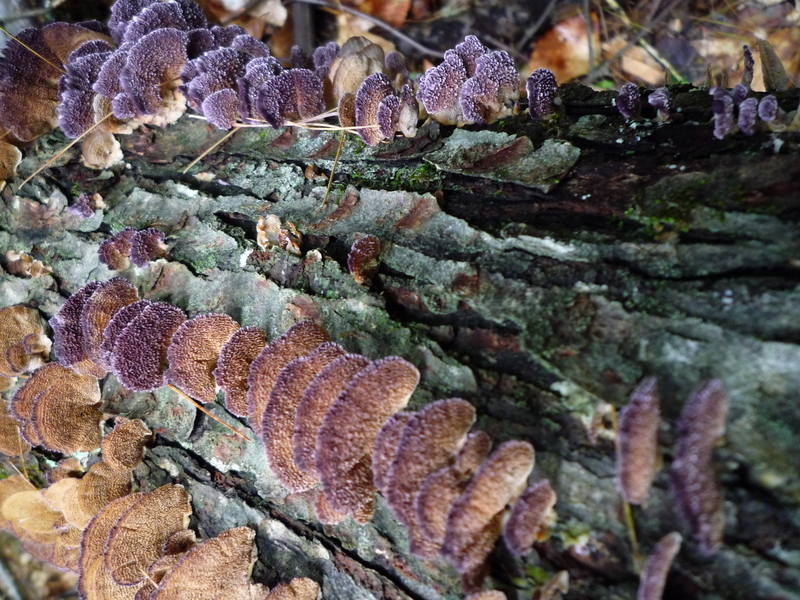 However, almost as good, I photographed some lovely (and slow moving) purple fungus. Enjoy. This entry was posted in Scans, Treatment and tagged 1066. Bookmark the permalink. GOOD NEWS!!!! We were so happy to read it! Enjoy the summer! Hope to see you both when we come in August! Linnea, i just found your blog. My husband also has Stage IV lung cancer, BAC. He has been at it for 8 years. Check out my website. interested in comparing notes. His last mets were to the bone, but thankfully he responded to the treatment. I was waiting for this good news. Progression stabs. Stable buys time. Time is better that money. Enjoy it with family and friends. Repeat in August can be a good birthday present for me. We are like babies in the woods. Hug and kisses from us. Wonderful news! I am so happy for you. Steve and I enjoyed meeting you and David yesterday, although I wish it was under different circumstances! We felt so good after talking with you and knowing that we all truly understood one another since we are on similar journeys. I truly hope we will meet many more times, in fact, Steve suggested that sometime this summer that we all meet for dinner in Meredith-interested in making a plan? We use to do a lot of boating on Winnepesauke in our before cancer days and we loved hanging out in Meredith. Let me know what you think. Thanks again for meeting up with us-really enjoyed it! I have been so hoping for wonderful news! I am, in a word, thrilled! May you be blessed with everlasting stability! Thank you for your output and for showing strangers like me that it s possible to be hopeful under any circumstance. Each time you post I get a little extra strength. I love to read yourscan was stable..that certainly is a good thing in the lung -cancer world……….Enjoy the feeling of stability! Glad to hear the good news. I think your natural strength, with the help of the 1066, brought you the result. Stay strong! Hooray! What terrific news. It’s especially nice to hear that the tumor can wiggle from time to time, but then settle back down and behave itself. Stable ‘n slow… ‘S wonderful. Linnea, I never know for sure how much of a difference attitude makes, but just like the good luck charms I carry ( so silly, a superstitious atheist), picturing myself invincible certainly seems to make it (seem) so.